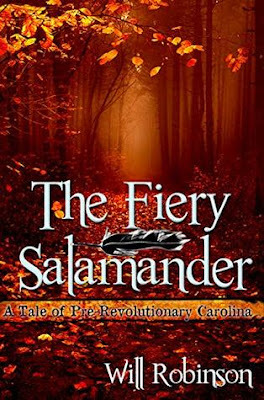 Historical Book Review: The Fiery Salamander by Will Robinson. Independently published on 13 January 2019. 417 pages. Book 1 of Back Country Novels. I was given a copy of this book in exchange for a review. The opinions given in this review are mine alone. Set in the year 1763 in the British Colony of Carolina. This is the story of 14 year old James Kirkpatrick, his extended family and close-knit neighbors. Life is hard for these back-country Scots-Irish settlers who eke out a living on their remote farms. An Indian raid sets in motion a series of events which dictate the next four years of James' life. As his life unfolds, he is pushed, pulled, shaped and molded, by family, friends, life, death and of course love. The author has done an excellent job fleshing out his characters, giving them distinct personalities and character traits. I felt I knew them all. Over the course of the book we see James evolve from a boy on the cusp of manhood to his maturity. His character is complex and multidimensional. Quite a few of the characters are Native Americans and I thought the author did a great job bring them to life and treated their plight with sensitivity and understanding. I appreciate that the good guys are flawed and the bad guys can earn our sympathy. Although there are few obvious 'historical events' that occur in this book, the historical setting seems spot on. The setting, the people, the way they dressed, spoke and lived are detailed and appear to be very accurate. I did not see anything that was 'out of time'. As a history buff, I was interested in the upcountry system of justice and the 'Regulators', the vigilante group which formed to enforce the laws and keep the peace. As a descendant of Scots-Irish immigrants I was also glad to see them accurately portrayed. The book is written in first person-present tense. Present tense is not my favorite as it is very easy to screw up. However, the author does a fine job and I was soon comfortable with his style. The pace zips along in the beginning and again at the end. I felt it dragged at times in the middle, but never enough to put me off. So this leads me to the one thing that I didn't like; the author employs a great deal of 18th century Scots-Irish vernacular. Reading his narrative and dialogue made me feel hate narvish. Know what that means? Neither did I. There were times when I thought the use of Scots-Irish words detracted from the story telling. This may not bother every reader, but I had to stop and look up the meaning of many of these words. Luckily, there is a Dictionary of Ulster Scots which I used to decipher his meaning. I really enjoyed this coming of age book. I think anyone who enjoys historical fiction, or has a particular interest in the region or time period will appreciate James' story. I would not hesitate to recommend The Fiery Salamander.